The capper of the Superkarts! USA SpringNationals doubleheader in Phoenix featured heightened intensity and a long list of the best drivers in the country. The second round of the Fikse Wheels Pro Tour offered the paddock a chance at either redemption, or a continuation of success, depending on each driver’s Saturday results. The mercury eased up a little, thankfully, offering temps in the low-90s, but the pressure was on for those who may not have excelled in the opening day of competition. Five drivers maintained their dominance, include Rick Dreezen (S1), Carter Williams (S2), Darren Elliott (S5), Callum Smith (S5) and Nick Tucker (TaG Master), while others broke through for their first wins on the circuit. Oliver Askew was the benefactor of a controversial call in TaG Senior, Brandon Lemke asserted his position as one of the top Junior drivers in the country, and Jason Welage found his top-three result elevated to P1 status following post-race penalties. The big winner on the day was the sport, as the competition was incredible, the racing exciting, and all of it was captured for prime time coverage on CBS Sports Network in late-May. Showing the way all day on Saturday, Sunday began in the same fashion with Louie Pagano (Tony Kart) opening up Round Two as the driver to beat. A 45.779-second lap was quickest of the 39-drivers, edging out Italian driver Matteo Vigano (Top Kart) by 44 thousandths of a second. 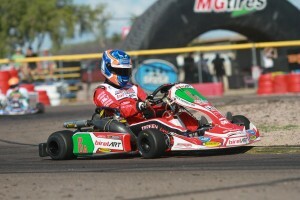 Oliver Askew (BirelART) improved his pace from qualifying on Saturday, placing third. 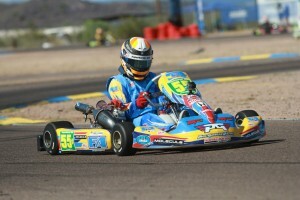 KartSport North America / Arrow drivers Roger Ralston Jr. and Ben Stewart capped off the fast five. Pagano used the pole position to his advantage, getting away in the opening corners and holding the lead the entire eight lap race. Vigano slotted into second until he began to fall off pace during the second part of the race. Both Askew and Ralston worked past for position, moving Vigano to fourth as defending champion Jake Craig (Formula K) advanced from ninth to fifth, bringing Austin McCusker (Deadly Kart) with him. The top five broke away to begin the second heat race, with Pagano showing the way. The order changed on lap two with contact, sending Vigano off into the tires at the end of the straight and Ralston back to the tail of the field. That put Craig into the second spot with Elliott Finlayson (Tony Kart) improving to third, pushing Askew back to fourth and Mason Marotta (Tony Kart) into fifth. The start of the TaG Senior final began with some controversy. The original start was waved off after the field got through the opening corner. During that time, Craig made incidental contact with Pagano, with the exhaust separating the Tony Kart of the pole sitter. As he made his way around the course, he tried to hammer back the pipe with his hand before the green flag waved. When the lights went out to begin the race, Pagano fought strong to hold the top spot but slowed with the exhaust breaking loose in the right hand corners. That gave Craig the lead with Pagano slowing to slam the exhaust back together down the back straight with his hand. Rejoining just inside the top-15, Pagano was shuffled back to 20th after contact, and eventually drove back up to 13th at the checkered flag. Up front, Craig led the entire way and crossed the line as the provisional winner. That was until officials penalized him for the contact in the false start. That gave the battle for second the victory, with PSL Karting’s Askew moving into the second spot as they took the white flag, and holding on to the finish, promoted to the top step of the podium. Finlayson looked to have the position in hand, but was rewarded with the second place trophy. Marotta finished third with Austin Osborne (Tony Kart) fighting back after flipping on Saturday to end up fourth and Brandon Jarsocrak piloting the American-made iKart chassis to fifth. Like the true professional driver he his, Rick Dreezen made it no question that he is the driver to beat here in the S1 division. 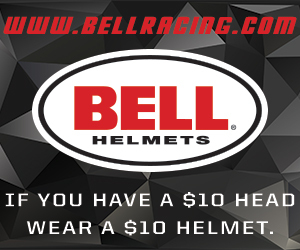 The PSL Karting / Birel ART driver posted a 43.943-second on his out lap, securing the pole position as the only driver under the 44-second mark. Kiwi driver Matt Hamilton (Aluminos) found speed overnight, coming in with the second quickest lap of the session. 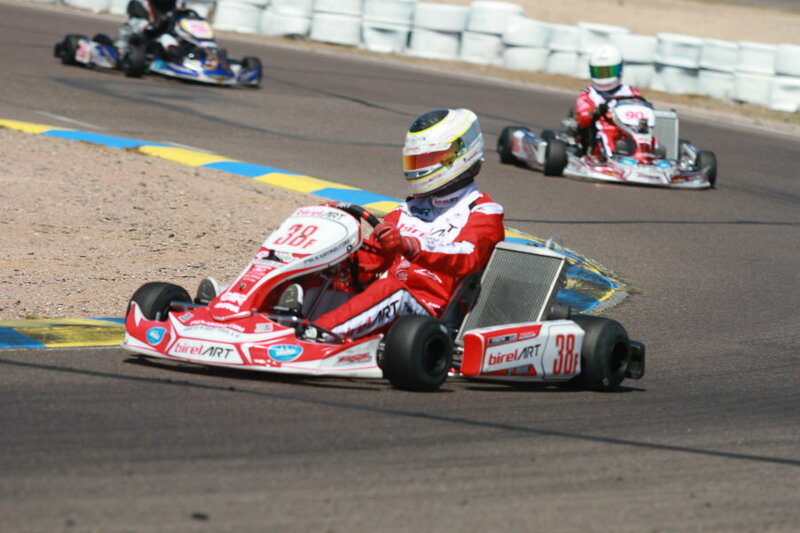 Billy Musgrave (Praga) led the American contingent with Kolton Griffin (Tony Kart) and Fritz Leesmann (CRG) right there. Dreezen went wire-to-wire for the opening heat race win. He stretched out to a 1.1-second advantage with Musgrave and Leesmann moving forward to second and third with Hamilton pulling off early for a loose rear bumper. Czech driver Patrik Hajek (Praga) advanced himself up to fourth, nearly working past Leesmann in the closing laps with Griffin back to fifth. Musgrave was able to grab the holeshot on Dreezen to being the second heat race, as the top five slotted in line together. Dreezen took over the lead on lap three going through the monza corner, as the top two began to pull away from the rest of the top-five. They remained that way to the checkered flag after seven laps. Leesman ran to third with Hajek up to fourth over Griffin. The holeshot to begin the 16-lap main event went to Musgrave with Dreezen missing out on holding the top spot into the opening corner. Dreezen kept the pressure on Musgrave, and was able to move into the lead before the end of the first lap. At the same time, Hajek moved to third ahead of Musgrave. They ran that way until after the halfway mark when the fight for second place heated up. Both Hajek and Leesmann moved past Musgrave for position. Then with two laps to go, Leesmann slipped past Hajek for the second position. 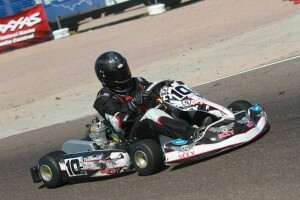 At the checkered, Dreezen scored his second victory of the weekend, earning maximum points toward the championship. Leesmann held off Hajek for second with Musgrave in fourth and Hamilton climbing to fifth. Carter Williams made sure to back up his Saturday performance by earning his second pole position on the weekend in S2. A 44.455-second lap was best in the qualifying session, edging out Luke Shanahan (Tony Kart) by just over a tenth of a second. Kol Baily (Tony Kart) improved up to the third spot, with Alan Michel (Praga) and Fernando Casillas Jr. (GP) rounding out the fast five. Williams went on to lead the entire eight laps of the opening heat race. The fight was for second as Michel fought his way forward to the second position, with Casillas following him through. Kyle Kalish (Merlin) broke into the top-five for the first time as he drove to fourth with Bailey back to fifth. Once again, the field was unable to get through the opening corners without penalty, with the second heat race coming to an end early for Bailey, Frank, Jim McKinney (Tony Kart) and Harry Gottsacker (Intrepid). Out front, Williams broke away early after Michel grabbed the holeshot, but fell to second before the opening lap was complete. Michel was under pressure from Casillas, Kalish, Shanahan and others. Both Casillas and Kalish worked past Michel in the closing laps of the seven-lap event as Shanahan fought off Daniel de la Calle (Aluminos) for fifth. 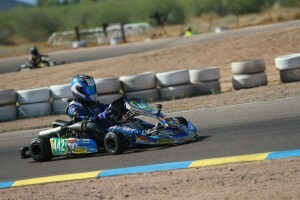 Williams made sure he left Phoenix as the driver to beat for the Fikse Wheel Pro Tour championship. The 28-driver field saw the lights go out, with a few drivers unable to get off the line clean. Kalish was unable to pull away with a mechanical issue, while Shanahan got a slow launch. No matter, Williams was away and out front in cruise control. Casillas and de la Calle slotted into second and third while the driver on the move was Andrew Bujdoso (PCR). Starting 11th, he was among the quickest drivers all weekend. By lap seven, Bujdoso was into fourth and began running down second and third. Putting the pressure on, Bujdoso was unable to move into a podium position. 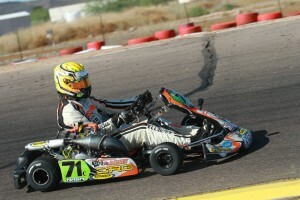 Williams drove to a dominant six-second victory over Casillas with de la Calle ahead of Bujdoso. Austin Schimmel (BirelART) bounced back from his bad luck on the weekend to finish with a fifth place result after starting ninth. Like the S1 and S2 categories, it was a quick out and in session for the S4 drivers. Many found the track space they needed, including Saturday winner Darren Elliott. The longtime CRG driver waited toward the end of the session to hit the track, posting a 44.920-second lap to secure the fast time. Jimmy McNeil put CRG on the front row for the opening heat, with Nick Firestone (DR Kart) improving up to third with Ryan Kinnear (Intrepid) fourth. Jorge de la Huerta (GP) was fifth as defending champion Gian Cavaciuti (Aluminos) sixth and former champ Jordon Musser (BirelART) sixth. Elliott went into cruise control for the opening heat race, with McNeil pressuring early until dropping a wheel. That allowed Kinnear a chance to take over the runner-up spot. Coming to the white flag, McNeil tried an inside move on Kinnear at turn 11, coming up short and making contact. Kinnear spun around and was unable to continue, while McNeil pulled off with damage. This moved Firestone to second as Musser drover to third over de la Huerta and John Crow (FA Kart) up to fifth from 11th. Opening corner contact in Heat #2 took Crow out of the race early, dropping him to 16th on the grid on the main event. Up front, Firestone was able to apply some pressure early, but Elliott stretched away lap after lap. The fight was for third with de la Huerta getting a handful of pressure from Musser, Richard Heistand (BirelART) and Cavaciuti. On the final lap, de la Huerta and Musser made contact in the penultimate lap, ending up in the dirt. This moved Cavaciuti to third behind Elliott and Firestone. Heistand was classified fourth with McNeil able to drive back to fifth with Kinnear behind him in sixth. Elliott capped off a perfect weekend in Phoenix, leading all 16 laps of the main event. Away early, the former ProMoto Tour star was on cruise control to the checkered flag to enter the SummerNationals at the driver to beat. Firestone held the second spot early on until Cavaciuti and Kinnear were able to move past for position. The top five shuffled up after contact between McNeil and Heistand. McNeil was unable to continue while Heistand drove to fifth at the checkered flag. Cavaciuti and Kinnear completed the podium with Elliott, while Firestone held on to fourth. 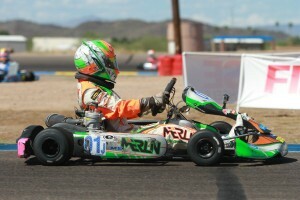 Heistand was penalized five positions for his contact with McNeil, moving Chris Neira (Tony Kart) to fifth. The TaG Master qualifying session was quick, with drivers putting in only one or two laps to try and securing their best lap toward starting up front for Heat #1. Saturday winner Nick Tucker (Tony Kart) posted fast time in the session with a 47.043-second lap. Brian Phillipsen found speed overnight, coming in just 88 thousandths off. Chris Giumarra (PCR) was third with Mario Barrios (Gillard) and Scott Falcone (Arrow) making up the fast five. Tucker made it look easy in the opening heat race, scoring the win by over two seconds. Part of the reason for the gap was the hard fight for second. Barrios emerged with the position, dropping Phillipsen back to third. Vatche Tatikian (FA Kart) powered his way from 10th on the grid to fourth, as Giumarra slipped to fifth. The top four drivers ran nose to tail the entire seven laps with the drivers exchanging the fast lap honors behind Saturday winner Tucker. On the final lap, Phillipsen was able to draft past Tucker going into the monza. They went side by side through the final corners with Phillipsen earning the win as Tucker nearly lost second at the line to Tatikian. Barrios was a close fourth with Anthony Honeywell in fifth after Giumarra was spun around in the opening corner of the race. Tucker would not be denied on the day, earning his second victory of the weekend to put him as the championship leader heading into the SummerNationals. Phillipsen led the field to the green flag, but Tucker put himself into the lead before the opening circuit was completed. From there, Tucker ran a consistent pace throughout the 16 laps and fighting for position behind him gave the North Carolina driver room to cruise to the victory. Peru driver Barrios worked his way into second, while Giumarra was on the move and into third by lap seven. Tatikian was challenging for the position and the two made contact in turn 11, ending both their races. That moved Honeywell into the third spot with Phillipsen trailing. The front of the order remained unchanged until the final lap. Barrios drove to second with Phillipsen able to slip past Honeywell for the third spot on the podium. Bonilla completed the top five. It was much of the same as Sunday’s round of racing began for the S5 division, with Callum Smith back at the top of the order. The Praga driver posted a 45.151-second lap to secure the pole position. 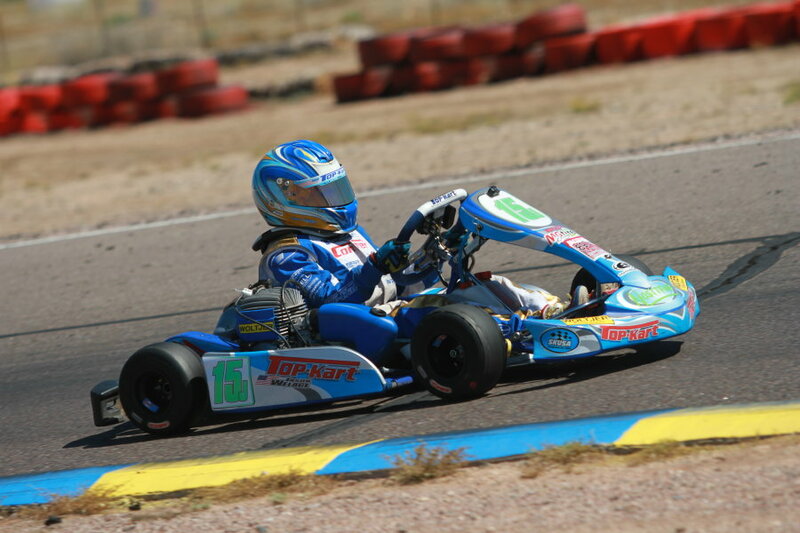 He was challenge late in the session by David Malukas (Top Kart), coming within two tenths of the time in just his second S5 qualifying session. Evan White (Kosmic) was third as the fast five was completed by Jason Pettit (Aluminos) and Andrew Engberson (Intrepid). The opening heat race was all Smith, leading each of the eight laps, but eyes were on Malukas. Getting through his first start, Malukas posted the fast lap of the race, staying with the Saturday winner, placing just two tenths back at the checkered flag. White and Pettit held their position through the race, as Ryan P. Lewis (Mad-Croc) advanced to fifth. Malukas was slow off the line to begin heat two, and that allowed Smith a clear path to the race win in Heat #2. Falling back outside the top-five, Malukas charged his way forward and was into the fourth spot before the two lap to go signal was displayed for the seven-lap race. Hunter Kelly (Praga) got a great start from sixth to sit second with White trying to hold off Malukas on the final laps. On the final lap, Malukas got a great run down the straight to take over the third position, pushing White back to fourth with Pettit placing fifth. The weekend could not have gone any better for Smith, as the new S5 driver swept the entire weekend, leaving Phoenix with a perfect score in the championship chase. Malukas was unable to get off the line, which signaled no challenge for Smith. White stayed close in the opening laps, but dropped back as the race went on. At the checkered flag, Smith scored the win by nearly eight seconds. White drove to second with Kelly putting on the pressure late in the race. Engberson finished fourth with Pettit holding fifth. 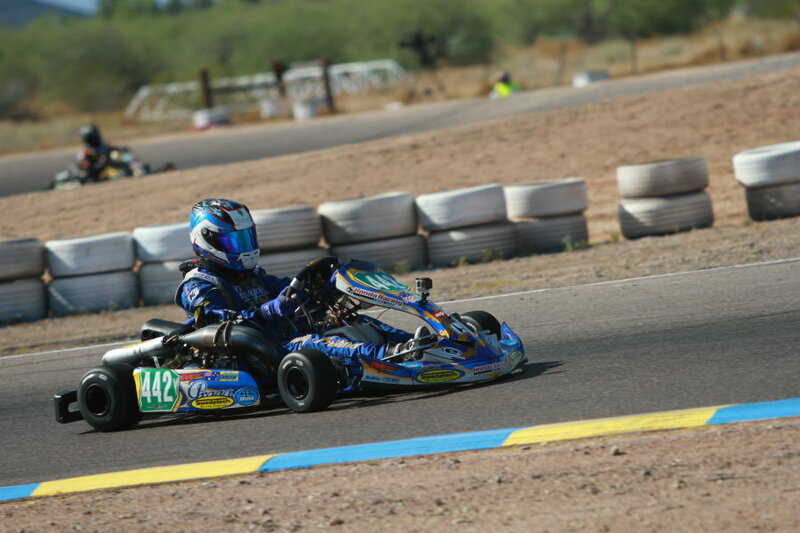 Riding off the momentum from a sweep on Saturday, defending champion David Malukas (Top Kart) scored the pole position late in the qualifying session. 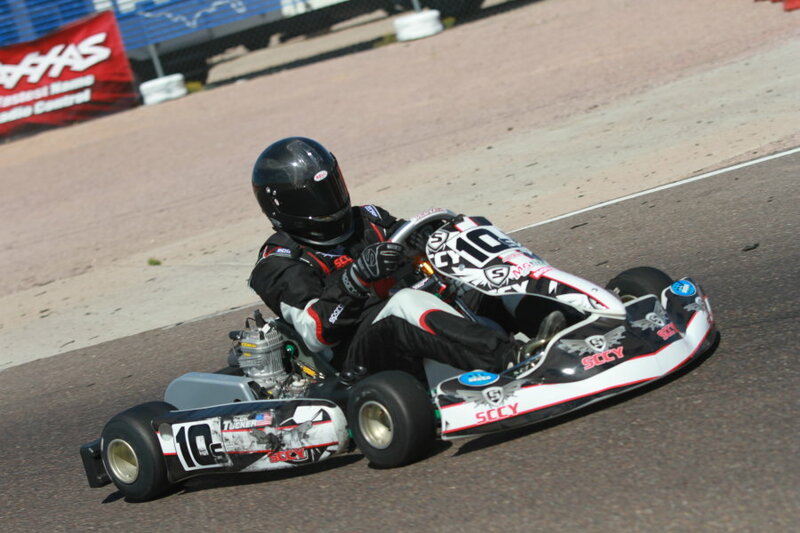 Hitting the track later, the SKUSA #1 plate edged out Trey Brown (Tony Kart) by 0.124 seconds. Brandon Lemke (Merlin) suffered a flat tire, but was able to get the third quickest lap in before pulling in. Anthony Gangi Jr. (Tony Kart) and Nicky Hays (FA Kart) completed the fast five. Malukas led a long train of drivers to begin the opening heat race, with Gangi and Lemke able to get right on the bumper of the defending champ to push away from the field. Lemke and Gangi took over the top two positions on lap four, allowing Hays to close in on the fight to make it a four driver battle. Lemke was able to get away to score the win with Malukas holding off Gangi and Hays. Hannah Grisham (Tony Kart) charged from 14th on the grid to win the battle for fifth. Heat #2 was a battle between Lemke and Gangi. At the beginning, Gangi held the point until Lemke took over before taking the white flag. Gangi looked to take the position back, but thought better to hold the second spot behind Lemke at the checkered flag after seven laps. Malukas held off a charging Jagger Jones (Tony Kart) and Sebastian Alvarez (BirelART). Hays fell to the tail of the order, involved in contact with Dante Yu (Tony Kart) and Dylan Tavella (BirelART) on the fourth lap. The top three pulled away early in the 16-lap Final with Alvarez trailing the leaders. Lemke set the pace with Malukas into the second spot early before Gangi retook the position. The trio ran unchanged to the checkered flag, as Lemke made a big statement with the victory, earning fast lap honors in the process. Gangi ran second with Malukas in third. Alvarez ran a solid fourth with Brown winning a battle for fifth. With the final circuit of the qualifying session, Lachlan DeFrancesco (Benik) stole the fast time from Saturday winner Jak Crawford (Energy). The gap was just 36 thousandths between the top two in fast laps. Anthony Willis (Benik) was third in the order, with Ryan Schartau (Tony Kart) and Tyler Maxson (Benik) making up the fast five. After two false starts, the drivers wrecked while trying to reform, with Philip Savopoulos (Praga) going over, complaining of a leg injury. The class regrouped and relined up, taking the green flag for their first heat. The race was dropped to just six laps, and on the final circuit, fighting for position, Crawford slowed coming out of the hairpin, dropping down to 41st position. Schartau won the race with DeFrancesco second. Oliver Calvo (Tony Kart) drove up to third with Willis and Maxson making up the top-five. Top four drivers pulled away in Heat #2 with Maxson unable to get on track after his engine did not fire. After seven laps, DeFrancesco scored the race win over Schartau with Calvo and Willis following through. Jason Welage (Top Kart) came from 10th on the grid to win the battle for fifth while Crawford advanced from 41st to 16th. The TaG Cadet final ended with a bit of drama, as Welage came away with his first Fikse Wheels Pro Tour victory. Schartau broke away after the green light was given to the field, but he was run down by DeFrancesco. They ran 1-2 the entire distance, setting up for a last lap battle. DeFrancesco was leading as they took the white flag, with Schartau slipping inside at turn eight. DeFrancesco tried at turn 11, but came up short with Schartau reaching the checkered flag first. Officials however penalized Schartau one position for jumping the start, while DeFrancesco was docked one position for unsportsmanlike conduct following the checkered flag. That promoted Welage, who won the intense battle for what was third, the victory. Schartau and DeFrancesco completed the podium with Willis and Sam Mayer (Merlin) making up the top-five.